There are 4 game variations to chose from. 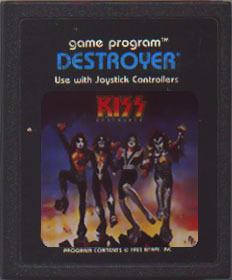 You are 1 of the 4 members of the rock band KISS (1 member for each game variation). Your goal is to totally destroy the city and anyone in your way. On earlier levels, your enemies are concert security guards. As you progress through the game, you face more competent opponents like police and finally the army. You would move right or left using the controller. Pressing up would make you jump and you could also jump at an angle. You would punch using the button. Pressing down would have a different function for each character. Gene Simmons (the Demon): Breath Fire by pressing the controller down. Ace Frehley (Space Ace): Teleport accross the screen randomly by pressing controller down. Paul Stanley (the Lover): Freeze all enemies with your gaze by pressing controller down. Peter Chris (the Cat): Double your speed by pressing controller down.